Captain Darla skillfully anchored the Coral Sea for the night, maneuvering the sleek 68-foot length away from the reef and into the shelter of Great Harbour on Jost Van Dyke in the British Virgin Islands. That accomplished, she headed below to the compact galley to prepare our dinner. Fresh-caught yellow fin tuna and sautéed island vegetables….as good as it gets. Her husband Jack regaled us with stories, as he often did during our week-long sail. “His name is Gato,” Jack said, “and he knows how to fix boat engines like no man in the islands. Gato is tough, really tough. Looks like a Maya Indian but with long blond hair, a huge handlebar mustache and ice blue eyes. Boy, he’s tough. “Why one time, after he’d repaired something or other for me, we were walkin’ down a side street in St. Thomas, and he stopped at a friend’s house. “He came out a few minutes later with a whole cooked fish. As we walked to the harbor, he ate that big fish, first one side then the other. Gentled by the easy rocking of the boat, and warmed by a splash of island rum on the rocks, we laughed uproariously at Jack’s latest tale. Then, captivated by the sky, we watched the rays of the setting sun lengthen behind the 1000-foot-high peaks. Later that night the rhythmic sounds of calypso ballads drifted across the harbor from the venerable Foxy’s Tamarind Bar and Grill. As good mariners must we clambered into the dingy, answering the siren call to join other sailors gathering for more storytelling and mingling. This kind of sailing was a new experience for me. 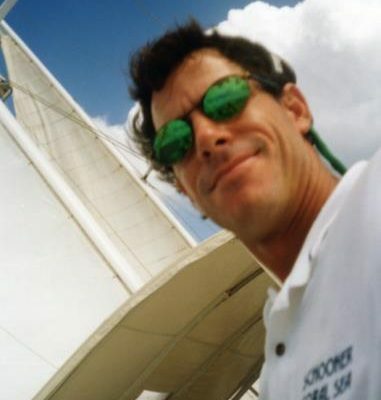 Beyond day-sails, I’d spent little time on sailboats, but always loving the water and constantly drawn to one Caribbean island or another, I readily accepted my friends’ invitation to join them. We evaluated several boats, ruling out those that we thought were too small for comfort—there would be four of us, plus three crew—and paying particular attention to crew biographies, we settled on the Coral Sea. Crewed by Captain Darla, her raconteur husband Jack and charming crew member Eric, originally from Alaska, the Coral Sea was a beauty of polished teak and elegant lines. She had been built in the ’70s at the Palmer Johnson boatyard in Sturgeon Bay, Wisconsin. We took this as a sign that she was meant for us. The week proved to be an excellent adventure as we made our way from Red Hook Marina on St. Thomas, to pristine St. John, Jost Van Dyke, picture-perfect Cane Garden Bay on Tortola, tiny Marina Cay, the tony environs of the Bitter End Yacht Club, and the snorkeling wonderland of Norman Island. Packing for the journey, I’d brought books…lots of books… and added several more from the boat library our first day out. I presumed I’d settle in to an easy rhythm of reading, relaxing, and trading stories as we cruised from island to island. To my complete surprise, I barely finished one book. I was so engrossed in the sailing experience at hand. A couple days in, with Darla at the helm skillfully guiding the schooner across windswept Pillsbury Sound off St. Thomas, we were immediately caught up in the intricacies of sailing. Though it was mid-March, we were encountering “Christmas winds”, most common in late December and considerably more aggressive than the typically tame March breezes we’d planned on. Unexpected gusts often set us heeling at an exhilarating angle, sending Eric scrambling nimbly across the deck, trimming sails or letting out line. “Darn fluky winds”, Darla often muttered in her Texas drawl. With adrenaline flowing, we braced against the tilt of the boat, quickly coming to trust Darla’s expertise as she maneuvered the 35-ton vessel safely away from reefs, through narrow channels and to one safe harbor after another. We easily became accustomed to life in compact quarters, rising with the morning light and bantering with Eric as he set out coffee and a bowl of fresh fruit on the aft deck. “Not as good as you,” he’d reply with a wink. “Soon come,” he’d say in his adopted island-speak. As Darla studied charts, calculated winds and set out the course for the day’s sail, Jack launched into yet another tale. “I was frustrated and losing patience. “So, where would I find him? I asked. The week went by too quickly, long stretches under sail balanced by quiet anchorages among other sailboats and the occasional luxury motor launch. When incoming craft were positioned for the night, rhythmic island music drifted from every corner of the harbor and mast lights bobbed and winked against the darkening star-filled sky. What had seemed so foreign only days earlier was fast becoming seductively appealing. We quizzed Darla and Jack incessantly about their departure from native Texas to live the past twelve years at sea on board this schooner and other boats they’d owned. In the vastness of the Caribbean they had raised and schooled their daughter, now a student at the University of Texas, and for several years they were simply “at sea,” out of touch with the world except for their radio—augmented by a cell phone, cruising the vast reaches. Over the years they had anchored for three months off Port Antonio, Jamaica, two months along the coast of Honduras, several months off Yucatan and Belize, and then sailed for long stretches, matching wits with a constantly changing, sometimes hostile environment. They became skilled at finding “hurricane holes” to tuck into when the big winds howled and battered. Their life style fascinated us, and we pondered the enormity—and allure—of leaving it all behind. Temptation tugged at each of us and we peppered them for details—we wanted a short course on what it would take to sail away. 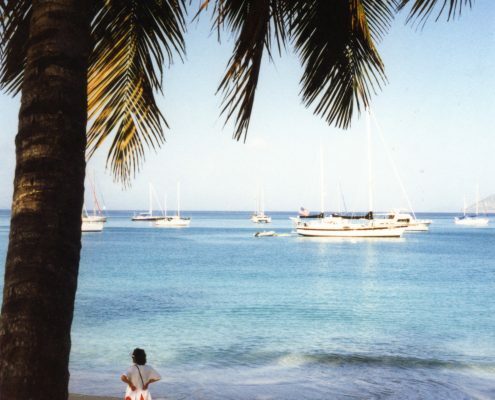 As most good things do, our sailing experience ended, and all too soon we were back in the harbor at St. Thomas. We hefted our gear into the dingy and prepared to say good-bye to three acquaintances that had become like family. As I hugged Jack, he said, “Hey….one last story. Jack’s voice followed us as we motored toward the dock and, turning to wave one last goodbye, we reluctantly headed back to civilization. © Betty W. Stark. This column originally appeared in several Midwest newspapers.